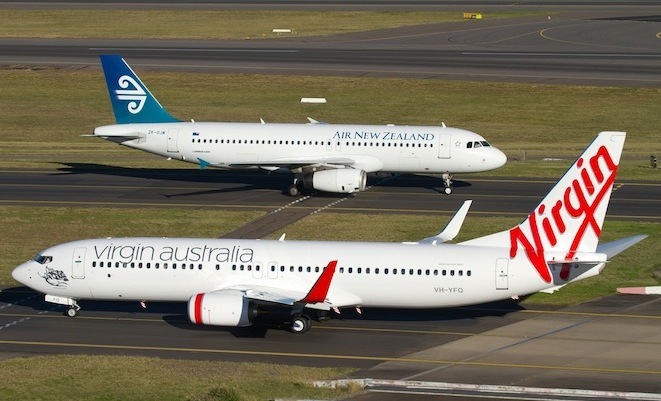 Air New Zealand has confirmed the sale of 19.98 per cent of Virgin Australia shares to Chinese conglomerate Nanshan Group. The sale, first announced on June 10, was completed on Tuesday, the company said in a statement to the Australian Securities Exchange. Air New Zealand pockets about A$267 million from the transaction, based on the sale price of A$0.33 per share and the 810 million shares sold. The company has poured in an estimated $460 million to accumulate its stake in the Australian carrier over the years, meaning it is selling those shares at a loss. “As a result of the sale, Air New Zealand’s holding in Virgin Australia is approximately 5.9 per cent,” the company said. Nanshan is expected to ask for a Virgin board seat. Air New Zealand’s shareholding is expected to reduce further once Virgin completed a share placement with Chinese company HNA Group, which is buying 13 per cent of the Australian airline group for A$159 million through the fresh issue of shares as part of a new commercial partnership. The share placement would take place once HNA received relevant Chinese government approvals, while the strategic alliance required the green light from the Australian Competition and Consumer Commission. Despite moving to offload its Virgin shareholding, Air New Zealand said on June 15 it would take up its full pro-rata entitlements in Virgin’s $852 million capital raising. Better start learning Chinese boys! VA have opened up a good market, but its a highly competitive one and profitability is not very high! Seems like another loss making exercise and more bailouts by the shareholder! Time to sell VA shares and wait and see how many slots they actually get, as I think they have over stated their ability to capitalize on this in the short to medium term.